It can be hard to imagine what a walkable neighborhood might look like, or how we can go about creating it. The National Resources Defense Council (NRDC), a New York-based environmental advocacy group, which supports compact walkable development, has made available a number of animations to show how existing streetscapes can be enhanced by smart growth development. The results are a ‘how-to’ of walkable urbanism, showing how many of the things that Walkable Princeton supports – mid-rise mixed-use development, traffic calming, shade trees, and transit – can be mixed together to bring about the sort of vibrant, walkable town that is particularly valued. The particular example shown in the images above is from Mount Pleasant, SC, a prosperous, growing, suburban town near the state capital, Charleston. In the sequence we can see a series of steps that are imagined to enhance a low-rise residential neighborhood by enabling Smart Growth development. You can find a higher-resolution animation that shows the development sequence more clearly by clicking here. NRDC in fact makes available a large number of these animations. You can browse a series of urbanization scenarios, or look for models of urbanization at different sites around the USA. We find these animations extremely helpful. When embarking on a journey, it is a good idea to have some pretty clear idea of the road ahead and the destination. 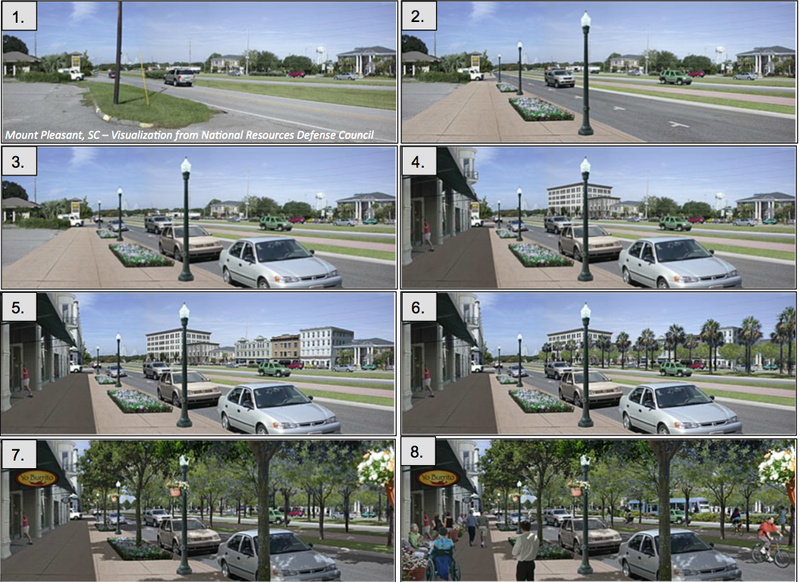 These animations demonstrate that the outcome of smart growth can be very positive. Everything is obviously a matter of taste, but for us, the neighborhood pictured in panel #8 (above), with transit, easy walking and biking, and nearby homes and restaurants, seems much more attractive than the traditional car-dependent, inefficient land use pictured in panel #1. What’s more, these images show that smart growth does not mean New York-style skyscrapers or Trenton-style urban decay. Walkable development brings the vibrant, livable environment that is the very best of Princeton. This entry was posted in Density, Smart Growth. Bookmark the permalink.